Jeff Steed rode into Carmon looking for work, but when he got caught up in a bank raid he found himself running from both Sheriff Cassidy Yates and the bank raider Blake Kelly. To escape from the net that was inexorably closing in on him he assumed the identity of a dead man. But as that man was the leader of a supply convoy, he had to undertake a hazardous journey across the Barren Plains to the silver miners at Bleak Point. With the convoy being escorted by the lawman who had been trying to catch him and the bandit he double-crossed hiding out in the Barren Plains, can Jeff ever hope to survive? Having read one of I.J. Parnham’s books before, and really enjoying it, I had high hopes for this. Would I be disappointed in Riders of the Barren Plains or would it live up to my expectations? Right from the start the author gets his hero involved in a series of circumstances that has the reader wondering how he can come out of them on the right side of the law - never mind with his life. As the story progresses at rapid speed, Steed finds himself getting into more and more dangerous situations that see him trying to conceal his identity behind a fragile web of lies. Each time I thought I knew how Steed would solve a particular problem, Ian Parnham threw in yet another plot twist that kept this reader glued to the pages, making this book almost impossible to put down. Having Steed riding with Sheriff Yates gave the author the opportunity to create some superb, tense, battles of wits as suspicion rises in the lawman’s mind. This isn’t Yates only problem as a headstrong girl searching for her sister joins the party. As mistrusts strengthen and the shadow of the Dark Riders falls across them all, so Ian Parnham ups the pace, which includes well described fist-fights, knife fights and plenty of gun action, as secrets are slowly revealed and surprises sprung and solved. Characterizations are beautifully developed and Ian Parham’s descriptive prose paints vivid imagery within the minds eye, so well you can share the fear and frustrations of Steed, taste the dust and feel the heat of the Barren Plains. 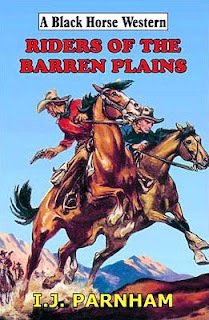 So, to answer my earlier question, yes this book did live up to my expectations and more, meaning Riders of the Barren Plains is my top choice of the BHW I’ve read this month, and I wouldn’t hesitate in recommending this book to fans of the western genre. Readers may also be interested to know that Sheriff Cassidy Yates appears in a number of Ian Parnham’s books. Riders of the Barren Plains has an official release date of today, July 31st, but is available now from many Internet booksellers. I suggest you get your order in asap before it sells out. Someone is rustling livestock from two of the largest cattle operations in Short Creek basin and everyone is busy pointing the finger at his neighbour. Elias Fagan, a drifting cowboy with experience working with the law, has agreed to look into the situation and quickly finds himself caught smack dap in the middle. It’s swiftly made clear that catching the rustlers won’t be easy. Nobody is supposed to know anything about Fagan but before he even reaches Short Creek someone tries to ambush him. Then in town no more than an hour, he is savagely beaten. To add to his troubles outlaw members of the old Hole-in-the-Wall gang turn up and recognise him. Maybe, he realises, there is more going on than just cattle theft. It’s action from the start as Fagan narrowly avoids being shot only to nearly drown whilst escaping his would be assassin, and from there the author piles on the problems of staying alive for Fagan, never mind the difficulties of trying to figure out who is behind the rustling. Fagan has plenty of suspects; the ranchers, who seem to be friends – even trail drive their herds together, the successful horse ranchers, the blacksmith, the girl who dislikes him from the moment she sets eyes on him, and more. Of course I had my thoughts on who would turn out to be the person behind the rustling although I couldn’t put my finger on why. As I read on I kept changing my mind as the author dropped in a few more clues and false leads. In fact I didn’t work it out until J.D. Ryder decided to reveal all. This book is a little longer than most BHW, using smaller print so it comes in at the same number of pages as the majority of BHW. The story flows well and moves forward at a fast pace making for a very entertaining read. There are a few surprises too, mainly to do with the fate of a couple of the characters. I’d not read anything by J.D. Ryder before – this is his second book, the first, Sacred Hills Massacre came out in August 2008, and a third, The Branded Man, is due to be published in December 2009 – and, on the strength of this story, I’ll certainly be looking out for them. 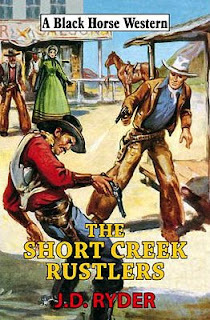 The Short Creek Rustlers is officially published tomorrow, July 31st, but is available now from the usual Internet booksellers. Look sharp, hit hard – that’s the Derby Man’s style. He’s a fast-moving mountain of muscle who throws himself into the thick of the West’s greatest adventures – like the Pony Express, a gruelling 2,000 mile race through hell. The pace and terrain are deadly enough but vengeful Paiute warriors and murdering saboteurs led by a sadistic giant threaten to turn the route into a trail of blood. Until one man has the brains and brawn and guts to save the Pony Express – the Derby Man. Gary McCarthy once more involves his hero, Darby Buckingham, in events that helped shaped the West and became part of America’s history. At the urging of his publisher Darby finds himself witnessing, and becoming involved with, the formation of the Pony Express. Many real-life people fill the pages of this exciting and fascinating story, such as the men who set up the Pony Express and those who rode for them. Not only are there the problems with setting up such a grand scheme but there are other obstacles to overcome, such as the fury of nature and that of the Indians, whose land they must cross, plus the men who want to see the venture fail for their own personal gains. It’s a tale full of frustrations, bravery and ambition. A story told through the eyes of Buckingham who has his own problems to solve, such as his on-going relationship with Dolly Beavers – which provides some excellent battles of wits and laugh-out-loud moments. There are many memorable moments in this book, such as the well written historical and courageous rides of Warren Upson and Pony Bob Haslam. 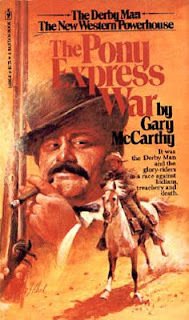 For me Gary McCarthy has managed to combine both fiction and truth in a gripping read that teaches the story of the Pony Express without the reader feeling he is part of a history lesson. This book has definitely left me eager to read more of the Derby Man’s adventures. Joe Kettle possessed the grit and fighting blood of his father, and his father before him. And he needed it, for Wilshaw Broome – once a loyal foreman of the Standing K ranch – was using hired gunmen in his effort to seize the Kettle domain. Supported by an ageing Hector Chaf and Ben McGovren, Joe sets out to win back his birthright. But each of the three men has his own special reason for going up against overwhelming opposition, and it wasn’t all to do with property and livestock. To overcome Broome’s force, they would play a waiting game, take advantage of the hidden trails and scrub thickets along the Rio Bonito. Then, when the time was right, they would not hesitate to meet force with force and guns with guns. This is the first book I’ve read by Abe Dancer and the first thing I noticed about it compared to most other BHW is its length, it is much longer, not in page numbers but in size of print. Dancer tells his story in short chapters, beginning in the past as he lays out the foundations of the various families that will play a part in the struggle to gain control of the Standing K. This involves a fair amount of gunplay and a couple of deaths are quite graphically described. This is also where someone’s trademark of cutting off earlobes is first mentioned. The book has some good descriptive passages of action, landscape, and characters but also contains a lot of dialogue. The battle for the ranch is attempted through legal paperwork but it soon becomes evident this wont be enough and guns will have to back this up. The story is fairly straightforward and doesn’t offer much in the way of twists to the plot and finishes with a well written hand-to-hand fight that ties the story up well. If you decide to buy a copy of this book I suggest you search for it by its title as it can be found listed as by two different authors – Abe Dancer and Caleb Rand. Both these authors are actually the same person, Carl Bernard (the pseudonyms being anagrams of his name). Another interesting fact about Carl Bernard is that he provides his own cover art for his books. Rio Bonito has an official release date of July 31st but is available now. It was hard not to like young Kid Silk. Even Coder, the hard man of the gun, found the Kid good company on the trail, after riding to Mexico to bring him home. But the Kid’s sister expected Coder to bring her brother back dead, and he knew he could die trying to prove her wrong. He was fated to follow a long, hard trail with many dangers on the way before he could accomplish his mission. The above blurb gives the impression that most of the book is taken up with the journey back from Mexico but the opposite is true. After a violent introduction to Ryan Coder and him being hired to find Danny Wardlaw – it’s unknown at this time that he now calls himself Kid Silk – the main part of the story is taken up with tracking down the Kid. During this time there is plenty of action and during these confrontations the author makes sure the reader knows just how hard Coder is. This latter part is important as to strengthen the impact of the end of the story. Once Coder has found, and freed the Kid from his Rurale captors, the trail home can begin, both men unaware that some vengeance seeking bandidos are planning to ambush them and a group of Rangers haven’t given up on their mission to bring the kid in for justice. This, of course, leads to lots more fast moving gun action that finally exposes some truths about the Kid, which in turn leads to a different side of Coder being revealed, making for a moving ending to the book. Does Coder manage to bring the Kid home alive to prove that Danny’s sister’s views about him are wrong? That’s something I’m not going to answer, just say that if you choose to read this book you should enjoy finding out for yourself. 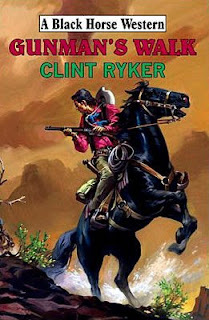 Clint Ryker – presumably a pseudonym – is a new author to me, and is a writer I shall be keeping my eye on. Gunman’s Walk is Ryker’s fifth BHW. It has an official release date of July 31st but is available now. The Arizona desert – home to Casqual and his Apache raiders. Fearless and merciless, they struck like lightning, killing settlers and disappearing back into the sheltering desert. The local cavalry troops seemed helpless to stop them. So Ruffin T. Justice was sent to catch the renegades and put an end to their senseless slaughtering. Ruff Justice is a scout for the US Army in this adult series that ran for 28 books, the first being published in September 1981 and the last October 1986. I believe the author behind the pseudonym of Warren T. Longtree is Paul Lederer. What seems to be a pretty straightforward assignment soon becomes much more involved when Justice arrives at Fort Bowie, Arizona, and finds the fort’s commander, Colonel Lasseman, resents his presence. 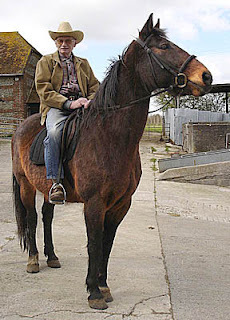 In fact he soon finds himself ordered to stay behind while the army attempt to track down Casqual. Something is definitely suspicious here but Justice’s endeavours to discover just what is going on are thwarted every time. In fact so much so he leaves the fort and sets himself up as the new Indian Agent on the nearby Reservation in the hopes of unravelling the mystery. 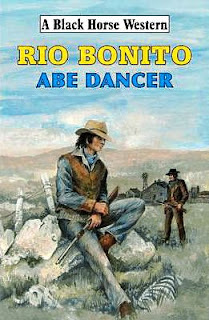 The book is fast moving and has plenty of action before Justice manages to work his way through all the entwined twists and turns of the plot to solve, and deal with, just what is going on in this part of Arizona, which includes the reasons he’s not welcome at the fort, a slave mine, and the problems at the reservation. All in all an exciting and satisfactory read. Mark Bannerman is the pseudonym used by Tony Lewing. With around twenty books to his name, Tony has found himself unable to produce any new work for sometime, but has agreed to talk to Western Fiction Review, thank-you Tony. I loved writing essays at school, turning most of them into stories. Later on, I took a correspondence course on being a writer and thereafter it became a hobby that incorporated my interest in the American West. I have accumulated a considerable library of reference books about the old frontier and writing in general. 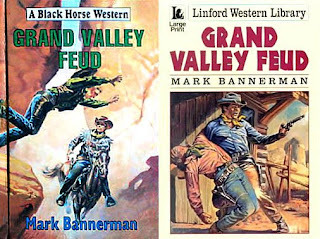 The first book I had published was a Western called Grand Valley Feud, a tale of conflict between cattlemen and sheepherders. I originally wrote this in 1959 but it was too long for Hale. In 1995 I shortened it and resubmitted. This time it was accepted. Thereafter, when I retired from the Army, I wrote full time. Being an Englishman, why did you choose to write westerns instead of any other genre? I owe my interest in the American West to my grandfather who, when I was a child, took me to see countless cowboy films. I became an avid fan of Hopalong Cassidy, the Lone Ranger & Tonto, Roy Rogers, Gene Autry, Buck Jones and so on. My grandfather read nothing else but Western books and his enthusiasm for the genre rubbed off on me. More recently I have visited Western America on several occasions. I have ridden the Western trails, visited old Indian strongholds and Army forts, battle sites, ranches and museums. In researching Ride into Destiny, I explored the site of Fort Phil Kearny, walked the trail of Fetterman’s debacle and followed the route taken by John Portugee Phillips as he set forth to carry word of the tragedy to the outside world. I have paid homage at the graves of Fetterman, Red Cloud and Captain Jack. In 1951 I read Will Henry’s No Survivors, a brilliant book about Custer, Crazy Horse and Fetterman, and this proved a profound influence. I loved the first person narrative and blend of history and fiction and determined to try my hand in a similar vein, starting with short stories. Will Henry certainly. Others: Ernest Haycox (Bugles in the Afternoon), Jack Schaefer (Shane), Harvey Fergusson (Grant of Kingdom), A.B. Guthrie (The Big Sky), Wayne D. Overholser (Gunlock), Glendon Swarthout (The Homesman), Elliot Arnold (Blood Brother). The Earthbreakers by Ernest Haycox – a wonderful book about the early settlers in Oregon, full of characters and the quirks of human nature. 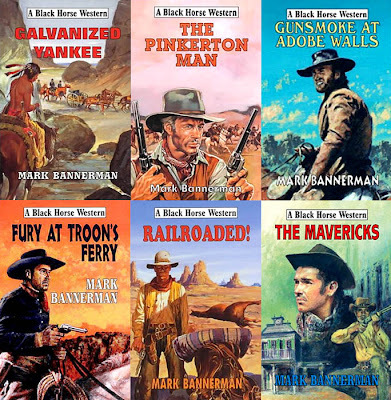 How long did it take you to write a Black Horse Western, and how did you go about it? Each book takes about eight weeks to write. I like my heroes or heroines to be up to their ears in trouble within the first chapter and thereafter to have the greatest of difficulty in sorting things out, ending in a climax that is not always predictable. Are all your westerns stand-alone titles or do any of them form a series? All my novels are stand-alone. My central characters face so much danger that I doubt they could survive a second outing. You wrote a book called Bender’s Boot, which I enjoyed very much, based on a real killer family. Do any of your other books use real people/events as the main theme of the plot? Frank Riddle – Frontiersman and the large print version The Frontiersman are both reconstructions of the Modoc Indian War 1872-73 with all its real-life characters, and is written through the eyes of interpreter Frank Riddle. I was fortunate enough to travel to the Lava Beds, Northern California, to do my research. I soaked up the atmosphere of the various battle grounds, interviewed Indians and historians and stood at the spot where General Canby was murdered. Many of my other books touch on historical events and people, or are suggested by actual incidents. 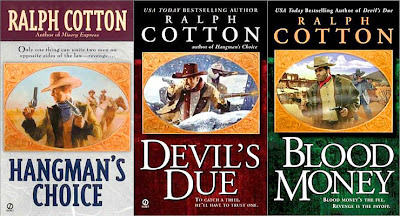 The Beckoning Noose (the Modoc War), Escape to Purgatory (the meeting between Billy the Kid and Governor Lew Wallace), The Early Lynching (mail order brides), Renegade Rose (the Oregon Trail), Man Without a Yesterday (Custer’s expedition in the Black Hills), Trail to Redemption (Civil War, buffalo hunters etc) Comanchero Rendezvous (post Civil War activities on the Staked Plains of Texas), The Pinkerton Man (Pinkerton Detective Agency), Galvanized Yankee (the battle of Shiloh and the Wagon Box Fight), Railroaded (the building of railroads), Lust to Kill (vigilantes), Blind Trail (Geronimo and the Apache Wars), Gunsmoke at Adobe Walls (The Comanche Wars), The Modoc Kid (Alcatraz), The Mavericks (illegal branding of Texas cattle) and Ride into Destiny (the Fetterman Massacre). Three further books were character driven: Fury at Troons Ferry, Legacy of Lead and Hog Tied Hero. Comanchero Rendezvous, Blind Trail, The Modoc Kid, Bender’s Boot and Gunsmoke at Adobe Walls. I particularly enjoyed writing these as I did when creating my humorous Western Hog Tied Hero. 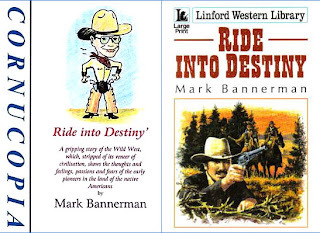 You’ve written a few other books with such titles as Short Story World (a how to book), Ride into Destiny, Frank Riddle: Frontiersman, and Under Western Skies, please tell us a little about them. I have had hundreds of short stories published on many different themes and I tried to pass on my experiences and techniques in Short Story World. 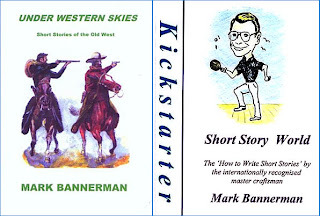 Under Western Skies is an anthology of my early Western short stories which were mostly published in International Storyteller. Cornish Woman is a non-western and has proved my most successful book to date. Also published have been two anthologies of non-western short stories. I’ve discussed Ride into Destiny and Frank Riddle above. I think the appeal of paper-produced books will always remain. The attraction of a good cover and the general feel of a well-bound book will not diminish. Dances with Wolves is my all-time favourite as it portrayed Native Americans in a very authentic light. Another Kevin Costner film Wyatt Earp was also very good. I’ve read countless Westerns, fiction and non-fiction, and my other recent enjoyable reads have been The Poisonwood Bible by Barbara Kingsolver, Alias Grace by Margaret Attwood and Star of the Sea by Joseph O’Connor. Also Birdsong by Sebastian Faulks and The Forgotten Soldier by Guy Sajer. 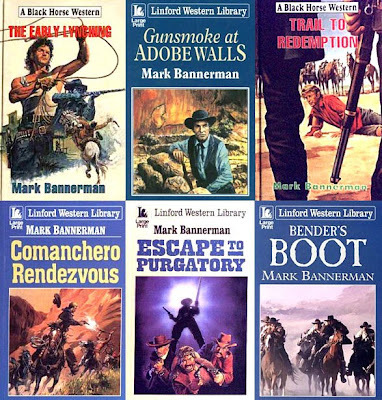 Finally Tony, you've always been a good Western writer, your fans miss you, is there any chance Mark Bannerman will make a comeback? Health problems have prevented me from writing recently, but I hope to regain my writing enthusiasm in the not too distant future. Scotch John MacGregor has a burning ambition to become as famous an outlaw as his forbear, Rob Roy. And he is well on the way to achieving his aim as he and his gang rampage across the State of Colorado, robbing banks, holding up stagecoaches, and easily eluding the various law enforcement agencies. However, fate takes a hand when Pinkerton agent, Dave Lansom, meets up with the renowned Kentuckian gunfighter, Jack Stone, and together they combine to track down the outlaws. As Scotch John soon discovers, the pair make a formidable team. J.D. Kincaid has been writing Black Horse Westerns for twenty years, and a few of his books sit in my collection as yet unread. It would seem that most of J.D. Kincaid’s books feature Jack Stone, and being a big fan of series fiction, I was looking forward to reading this. 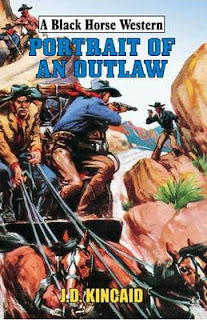 I was surprised to discover that Jack Stone doesn’t appear in this book until at least halfway through the tale, but then again the title is Portrait of an Outlaw so I should have expected most of the book to be about the outlaw in question. 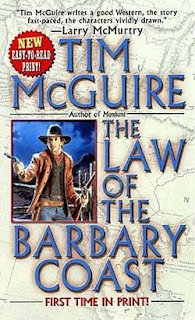 The book begins by following MacGregor as he arrives in Colorado, gets himself in a situation that leads to killing a few people, one of whom is a lawman, and finding himself on the run. Thus begins his career as an outlaw. Wanting fame, like his idol, Rob Roy, Scotch John, uses his reporter cousin to spread word about his crimes, and it’s this need to become famous that ultimately leads to his downfall. The book is very easy to read and moves quickly from one action packed event to the next. Kincaid rarely takes time to describe locations in any kind of detail, just does so enough to give the reader a sense of which part of Colorado we are in and this helps to keep the story moving forward at such speed. Character descriptions are also brief and to the point. The impact of bullets against flesh and bone are quite graphically portrayed, and, here’s my other surprise, there is isn’t any falling in love theme for any of the characters – this is something that seems to take place in nearly all the BHW I’ve read recently. That’s not to say there aren’t any women in the story, indeed it’s MacGregor’s involvement with a young women that begins his life as an outlaw and his kidnapping of another that becomes his final crime. And does this story make me want to dig out those other J.D. Kincaid books I have? Yeap, you bet it does. 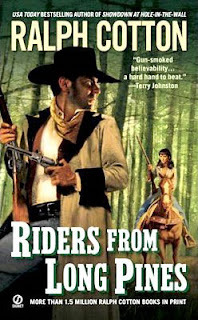 Kincaid’s hero, Jack Stone, is the kind of no-nonsense, get on with the job regardless, kind of western hero I enjoy reading about, so I can definitely see myself hunting through my collection for those other books I have sometime soon. Portrait of an Outlaw has an official release of July 31st but is available now from the usual internet sources. The sixth book in the series about Clay Cole, The Rainmaker. Clay Cole came to San Francisco looking for one thing - a certain beautiful red-haired singer. But the man known as the Rainmaker found something else altogether - trouble. He hasn’t been in the city for more than a few hours before he’s tossed in a cell, then with no explanation taken to meet some strangers with an unexpected propostion. This time Tim McGuire involves his hero in a battle for land that allows for some gripping action sequences. The gunfights are first rate and the plot moves along rapidly to its conclusion. But it’s not just the struggle for land and the mystery surrounding it that I found most entertaining. It was Clay Cole’s wide-eyed wonder at the modern technologies San Francisco had to offer, for instance the cable car and the lift. And does Clay ever catch up with the red-haired singer? Well that’s an answer you’ll just have to find out for yourself. Hard to believe but today is Western Fiction Review's first birthday! Can't believe I've been posting my reviews for a whole year. It's my pleasure, Steve. Thank you for inviting me. As far back as grade school I wanted to be a writer. Reading and writing always seemed to be among my favorite past-times and the two have always been closely linked for me. In reading a good book I always came away with the desire, or the inspiration to write a book of my own. But becoming a professional author was a dream that would be a long time in coming. 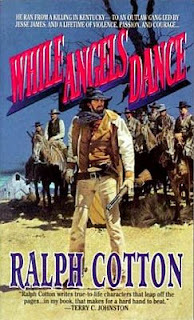 My first novel was a western titled: While Angels Dance. (The first in My Jeston Nash Series.) I ghosted some work outside the western genre in order to make ends meet until my work became more popular. But westerns have always been my preference in both reading and writing, and by the time my third or fourth book came out I was able to pull away from ghosting and apply myself full time to my westerns. I tell myself I'm not greatly influenced by other writers, but of course I am. When I read something that is well done, it influences me try to do just as well on my own work, if I can. So while I realize that I don't write like Cormac McCarhy, Robert Parker, Elmore Leonard or Ron Hansen, their style or cadence or dialog makes me want to do a good job. When I was trying to get a western to stick together, two western authors whose work helped me get my bearings were Cameron Judd, and Bill Brooks. A couple of their books, one titled Moon's Blood and another titled Bitterroot helped me develop what would become my style of putting my reader into the character's boots. It's important to me that a story be simple, but that it be well told. Those two books are examples of what I think a good western must do. They are neither one what the industry would call a "Big Book" but are good solid stories well written. That's how I try to do it. Those same two, Brooks and Judd, with them Matt Braun, Charles West and the late Ralph Compton, and of course any author who recommends me. There's many others that I know I'm going to fail to mention, so I apologize in advance. As lean as the genre is today it's probably safe for me to recommend just about any western author who's making it to the shelves these days. Mediocre work doesn't get published at all. Unfortunately, neither does a lot of the really good work. 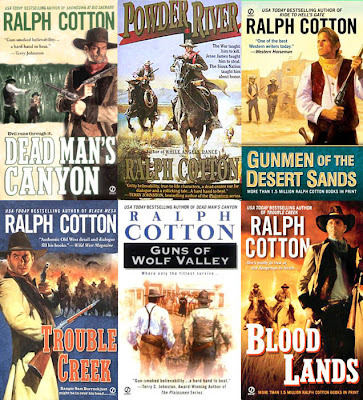 I miss the Giles Tippette novels, and a lot of those movie-to-book novels like The Good The Bad And The Ugly, by Joe Millard, The Wild Bunch, A Gunfight, which was taken from the old Johnny Cash, Kirk Douglas movie by the same name. I liked those thin quick-read books, and as both an aspiring author and a self-taught author, I learned a lot from them. 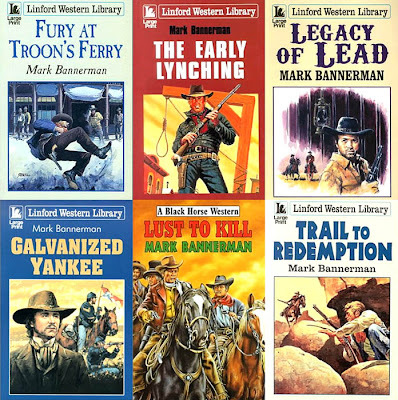 I'd also like to see books like Macy's Prairie Traveler and Matt Warner's Last Of The Bandit Riders on the shelves. Praire Traveler might be in some special print, but I'm certain Bandit Rider is not. Matt Warner's biography (some of it questionable I'm told ) of his days riding with Butch and Sundance and Hole-In-The-Wall Gang is good reading for a western fan. I'm fortunate to have a copy of each of these books. I'm always going back and rereading them. Please tell us a little about how you go about writing a book such as how much pre-planning you do, how much time you spend per day writing? Between books I spend as much time away from the keyboard work as I can. 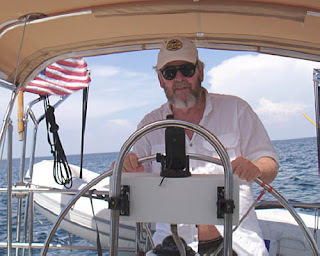 I do other things, sailing, fishing, traveling, playing music. But while I'm doing other things I'm getting some mental notes down, some ideas of who's going to do what, and why, for my next book. I'm always watching people, listening to what they're saying, and more importantly, why they're saying it. At the same time I'm searching old historical accounts, bank robberies, train robberies, hangings, shootings, weather conditions and whatnot. I try to keep a foot in the 1800s Victorian era social mores and customs, so I keep my story sounding authentic. Once I settle in to write, I have the story pretty much done, I just need to write it down. That's about six to eight hours a day or more until I get the satisfactory ending. Of course the story throws me some surprises in the actually writing. A character I had all set to die will become so good or so bad that I decide to keep them around for a book or two, or in some cases a whole new series. Sometimes, at the end I realize that the story took on a whole different focus or slant or meaning than I had in mind. Generally that's when I recognize that I've done my best job. Yes, but my current novel always gets priority. I might get an idea that won't work best for that particular story, but it's so good that I want to put it in my next book. I'll jump over and get it started, enough to sort of keep it on the warm burner for later on when I've finished my current project. 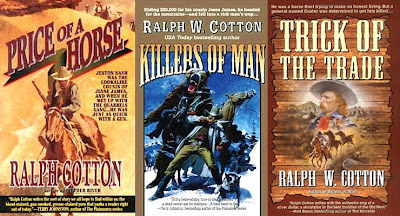 Your series about Jeston Nash was written in the first person whilst all your other westerns have been written in the third person, which approach do you prefer? I miss writing in First Party, even though for me it's harder work. Writing as Nash I was limited to his knowledge, to his perception, vocabulary and intellect. I had to dig deeper and find more simple ways of expressing through him than I would have had to by telling his story in Third Party. But it is matter of what you want the story to do. I wanted no great understanding from his character, just his day-to-day depiction of what life was like for him and his cousins, the James and Youngers, during and after the civil war. I'm proud of the work, in fact I'm proud of that whole six book series and hope to do more someday, but it was much harder for me to write than the Third Party work I do now. 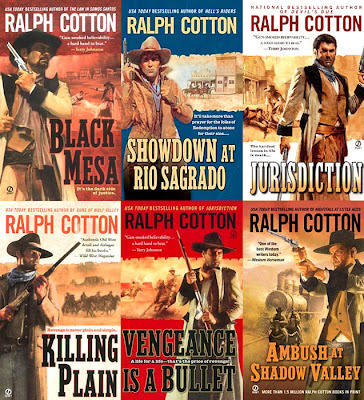 You’ve written four stand-alone westerns, do your prefer writing these or series books and have you any plans to turn any of these stand-alone novels into a series? I like writing either way, equally, but for different reasons. The stand- alone is not bound by some regular character's ethics, beliefs, or temperament. So, it's easy to make it up as you go along and it's almost like reading someone else’s book. Most movie deals are made for stand-alone novels, so that's a plus also. But writing a series novel is good because you already know the character, how they will most likely act, their past, their other experiences, their mannerisms, even the clothes they wear, their horse's name. Most important, you already know your readers like the character. 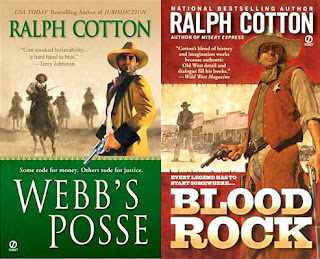 I just finished a book that brings a character back from one of my stand-alone novels titled: Webb's Posse. The fellow is a young school- teacher named Sherman Dahl. My readers liked him, so he's coming out in in a few months in a book titled; Fighting Men. My gunman series character, Lawrence Shaw made his debut in a Ranger series novel titled: Blood Rock. Shaw has been such a good character, I can't kill him off. He has two new novels coming out this year, Crossing Fire River, and Escape From Fire River. All of my series have started out as a stand-alone, including my first, While Angels Dance. But either my publisher or I have felt the work to be strong enough to warrant it becoming a series. You seem to have two books in the Ranger series published each year along with a couple of other books from different series. Is this a requirement of Signet or are you free to choose which series you write the next book for? My publisher, The Penguin Group wants the best book I can write every time out of the chute. Other than that, they give me all the room I need, and they trust me enough to know that my interest always dove-tails with theirs. We are both in the business of selling books. We rely on one another to do what we do to make that happen. 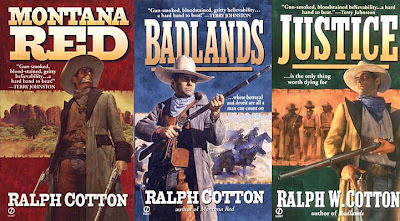 The first three books in your Ranger series are often referred to as the Big Iron Trilogy, why is this, and if there were originally plans to just write three books about Sam Burrack, how did the decision to continue the series come about? I think originally it was meant to be a trilogy, but the first three did really good in the marketplace, so we sort of doubled-down and let it ride, as it were. In order to keep writing the Ranger series I had to neglect another series that was originally a trilogy called Dead Or Alive. That series also did well, and was approved for a series beyond the first three books. But time never permitted. I hope to someday get back to it. It had a regular character named Quick Charlie Simms who is a Roma, a pool hustler and a golf hustler, among other things. You continued Ralph Compton’s series about Danielle Strange, how did this come about and did you find it as easy to write about someone else’s characters as those of your own? At Compton's demise, he had signed on to do three books about Danielle Strange. The first was Death Rides A Chestnut Mare, which I believe he wrote. I was asked to do the other two books to complete the contract for his estate, so I did, although I if I hadn't someone else would have. I happened to be available and Ralph and I were both ole Nashville pickers and songwriters, so I felt like I could carry his thoughts on to the story. The other two books did exceptionally well, so the publisher asked me to do a third. I did, but by then my books had started taking off, so I couldn't do any more without neglecting my own work. I had no problem writing about his characters. We were from the same background, wrote pretty much along the same line. 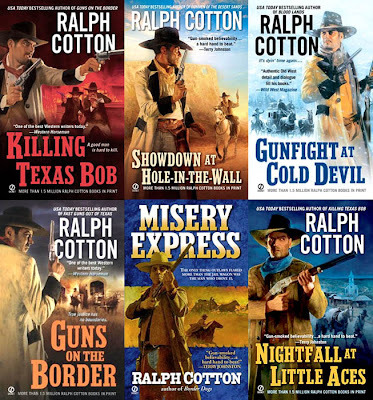 I wish Ralph had stuck around to see how well his books have done. He was a big ole country boy who loved what he was doing. I did book signings with him, you could see the light shine in his eyes talking about the old west. That's a hard one. The Nash books are always going to be my personal favorites, being my first series. I try to keep my quality of work consistent book to book, and so far I think I have. 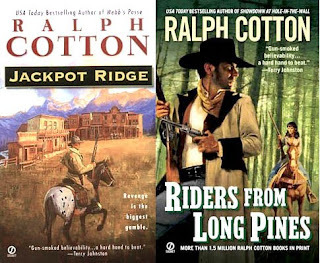 But if pressed for some current titles I'd have to say Jackpot Ridge, Webb's Posse, and Riders From Long Pines are about as good as I've got. If a reader doesn't like those three, they're probably wasting their time reading anything else of mine. I say these three, because I remember working pretty hard putting layer upon layer of story, depth and humanity into them. 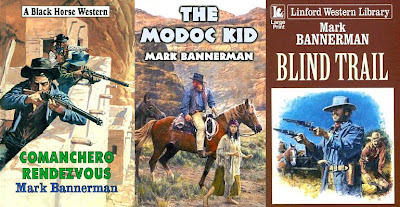 Out of those three, two are stand-alones, one is a Ranger Sam Burrack series novel. 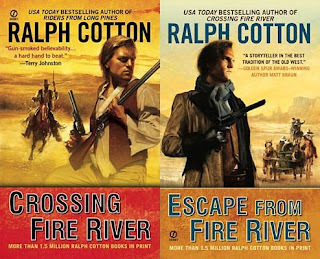 Later this year you have two books coming out with “Fire River” in the titles, is this a new series or are they part of an existing one? These are two books in the Lawrence Shaw series. The first in the series is Gunman's Song. Shaw is the proverbial fastest gun alive. He's a gunman from Somo Santos Texas who turned Samuel Burrack from being a buffalo hunter into an Arizona Territory Ranger. Shaw has gone from book to book as a sad pathetic figure mourning the loss of his beloved wife who was killed by what amounted to be fans of his who had only come to Somo Santos in order to meet him. In Crossing Fire River, on a drinking spree he ends up a with a wild and complex woman very much like Calamity Jane. They are still together in Escape From Fire River, but Shaw has been shot in the head while in a drunken stupor, and he has no idea who shot him. 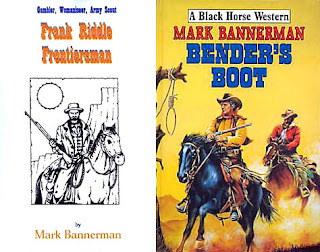 Have you written any westerns under any other pseudonyms and can you tell us which? I have never published a novel under another name. I have ghosted books, done work for hire, written articles, sermons and songs. But Ralph Cotton is the only name I've gone by so far. It's easy for me to remember. I used to not think so, but lately I'm starting to change my mind. My generation is used to the printed page, the feel of a book, the familiarity of the reading process. But future generations will have been more and more weaned away from that process. They might not be able to concentrate as well or as comfortably with a paper book as they will be with a familiar glowing screen. I know young carpenters today who still own a hammer but only get them out of their toolbox on rare occasions. They use nail guns. Mechanics use air tools. I can see readers going electronic. I think the western will rebound in the future; but how distant in the future, that's hard to call. Not everything in the industry looks bleak. 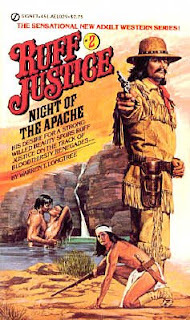 I commend a writer like Robert Parker for sticking some westerns out there. He didn't have to, but he took a chance and it appears to be paying off. I know he's a best selling author in his own right --but he is selling westerns. I know he has a successful detective series --but he is selling westerns. No matter how we want to look at it, he is doing what so many authors and publishers think can't be done today --he's selling westerns. I think it's great, and I'm glad he's doing it. It helps all of us. I read the authors mentioned above, and for pleasure I also read some older books over and over. I never tire of them. One in particular is Elmore Leonard's, Killshot. I also catch myself always going back to Mario Puzo's, Godfather. Wm. Blatty's, Exorcist, Webb's, Fields Of Fire. Hemingway, Kerouc, London. I know I'm leaving out some of my favorite authors. I enjoy all sorts of good fiction. When some drovers stumble upon the bloody aftermath of a stagecoach robbery, they discover a hidden cache of money that belongs to the most powerful man in the county. Briefly tempted to fill their saddlebags and run, they decide to do the right thing and return the cash. But that task may not be as easy as it sounds. Buckshot Parks, the outlaw responsible for the robbery, is dead set on getting back his money, and he has a stolen badge to hide behind while he tracks the “thieves.” But there’s a real lawman on Buckshot’s trail – Arizona Ranger Sam Burrack. With his shotgun-toting partner, Maria, he’s determined to catch the outlaw and get to the drovers before they meet with serious harm for doing good. 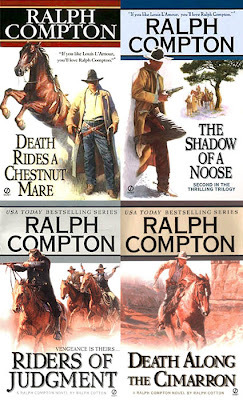 Riders from Long Pines is the twenty-second book in Ralph Cotton’s Ranger series, featuring Arizona Ranger Sam Burrack. 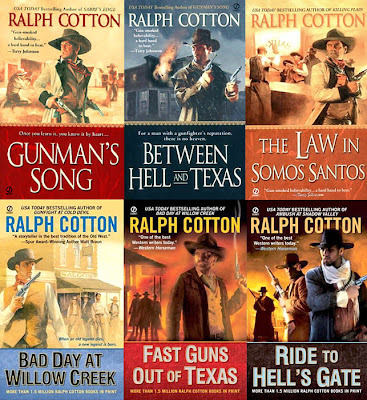 Ralph Cotton once more creates a set of believable characters in a very fast moving story. The hold-up of the stagecoach, that sets events in motion, is extremely well told and with the discovery of the hidden money he soon had me wondering how the drovers could return the cash without being accused of being the robbers themselves. In fact it’s this worry that causes most of the problems for the drovers. Ralph Cotton tells the story in easy to read prose and often switches from one set of characters to another, in fact it’s probably the drovers who take centre-stage in this story, rather than Sam Burrack. Buckshot Parks makes for a superb outlaw but he isn’t the only one tracking down the drovers, there’s also Grissin – the man who claims the missing money is his - and his posse. As the story unfolds it becomes clear that trying to do “the right thing” can get you in as much trouble as being on the wrong side of the law. The plot is pretty much a straight forward chase story, with more than one side tracking another, and as the book nears its end and all party’s come together for a final exciting showdown, Ralph Cotton throws in a nice twist as one person turns out to be someone other than first believed. And if you’re a dog lover, who will be able to forget Sergeant Tom Haines? Look out for an interview with Ralph Cotton in the next couple of days. In the frozen Beartooth Range, Fargo finds himself without his mount, his Colt, or any chance for survival – until he’s rescued by a kindly wilderness woman named Mary Harper and her children. And he’ll get his chance to pay them back, because brutal Cud Sten and his gang want what the Harpers have. But the snowbound sidewinders don’t expect to get what the Trailsman is going to give them. As expected from a Trailsman book this is a fast, action packed, read, which begins with Fargo finding himself close to death in the snowbound Beartooth Mountains. If that is problem enough he’s set upon by a pair of hungry wolves, this part of the book making for a nail-biting bloody scene that makes you wonder how Fargo can possibly survive, and is one of the best man v wolf confrontations I’ve read for a long time. Cud Sten and his men, especially Rika, make for some wonderfully vicious adversaries for Fargo. Sten’s choice of weapon provides some of the more brutal moments of the story. The more savage scenes are counterbalanced by humour, often provided by Mary Harper’s children. But it is Mary herself that David Robbins (writing as Jon Sharpe) uses to reveal a side of Fargo not often shown. After Fargo nearly dies in the snow he begins to think about his life, in particular the women he’s met and whether he could ever contemplate settling down, perhaps getting married. When Mary hints – none to subtly – that she’d be happy to share the rest of her life with Fargo, David Robbins delves a little more deeply into just what it is that makes The Trailsman the man he is. 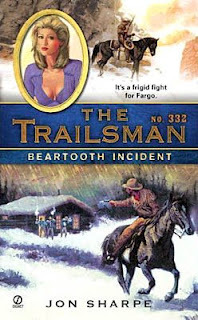 Beartooth Incident provides all the action any fan of this series would expect and is a well told and gripping read, and this time offers that little bit more by exploring some of the passions that drive the Trailsman.